Posted on 6/23/2015 by Tom Smith. 0 Comments. Some of the biggest challenges respondents faced in SAP training ranged from ‘insufficient training budget’ to ‘have no time for training’. The SAP training survey found that 57% prefer online training to traditional classroom training. But, only 41% actually received their SAP training via online options. How did you actually receive training? Further, 57% (there’s that number again) of respondents said they received little to no training at all in the last 12 months. Line this last bit up against the fact that 48% of respondents said they needed 31-plus hours of training to do their jobs effectively, and Houston, we’ve got a problem. How much training have you received in the last 12 months? As you can see, the survey dug up quite a bit and it puts a harsh, squinting light on the progress (or lack thereof) of SAP training. All of this is quite alarming because SAP is a software, and as with most software, it can be complicated. Not to mention, generally a software (or a program or an app) reinvents, updates, progresses. If you are an SAP professional, to not have consistent training is tantamount to a Google AdWords professional not understanding the nuances of each Panda release. Or, to be cheeky – a professional team or athlete never studying film of the other team before a big game or match. 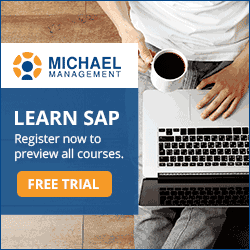 So why are there so many cracks in the road to a successful SAP training program? Maybe it’s because there is still a vast majority of companies, particularly small-to-medium-sized, that have not embraced online learning. Online training and/or eLearning is the perfect foil for a lot of the problems voiced in the survey. Next week, we’ll break down what we know. Come back and see. Tom was the head of our Marketing team and was with Michael Management for over a year. Tom has extensive experience in gamification, Google Adwords, and Social Media activity.